This is what the Palestinian government in Gaza is broadcasting on TV and trying to teach Palestinian children. This video provides some important context about Nakba Day, the Palestinian refugee crisis, and the right of return. A senior Palestinian Authority official accused Hamas of sending Palestinian civilians to die for media coverage during the Gaza border violence in 2018. During the 2018 Gaza border violence, rioters used burning kites to set hundreds of fires in Israeli territory. One rioter told NPR that they drew swastikas on the kites to let the Jews know, “that we want to burn them”. During the 2018 Gaza violence, Hamas leader Yahya Sinwar threatened Israelis that the rioters would take down the border and, “tear out their hearts from their bodies”. Hamas co-founder Mahmoud al-Zahhar admitted that labeling the “March of Return” as “peaceful resistance” is inaccurate. It is crucial to understand that there are Israeli families living walking distance from the Gaza border, and that they deserve protection from Hamas and other racist terrorist groups. 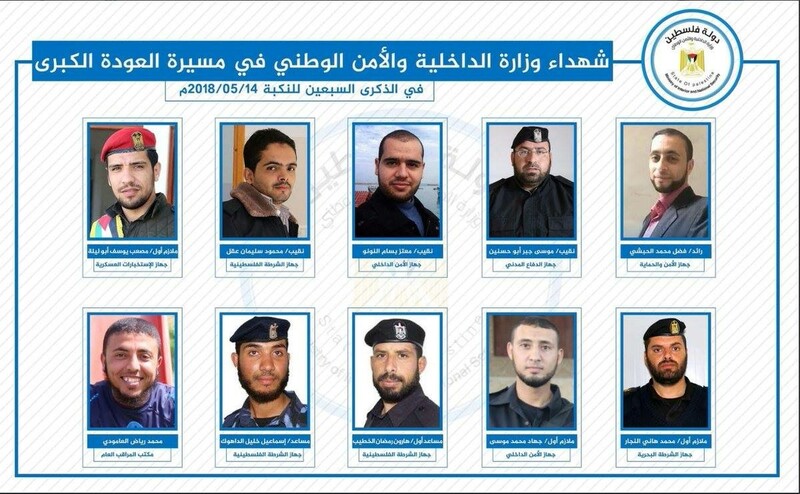 During the 2018 Gaza border riots, many of those wounded or killed were initially called civilians but later revealed to be members of terrorist groups like Hamas. 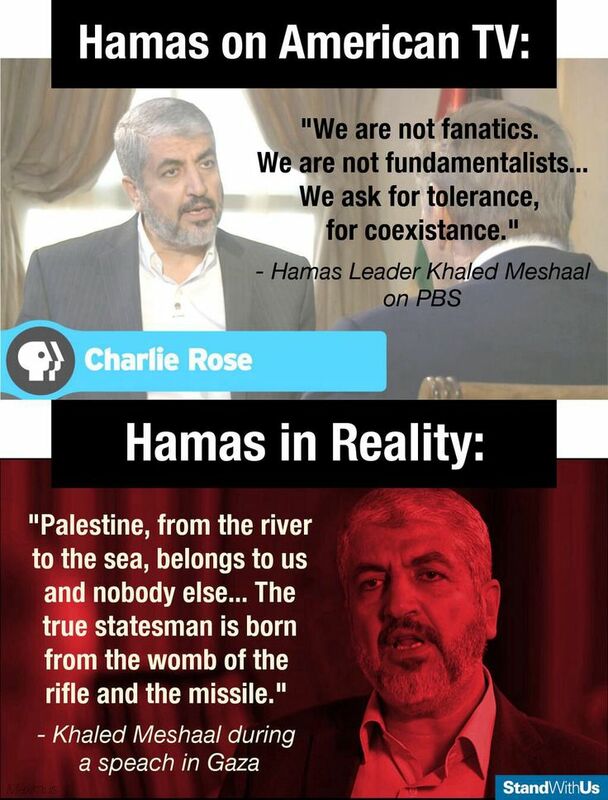 This image from Hamas is one example of that. 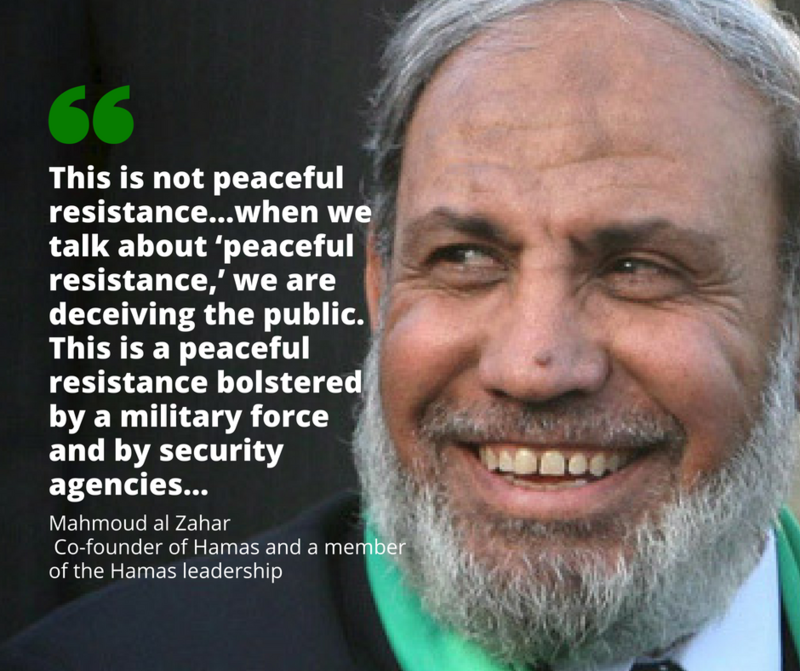 Hamas co-founder Mahmoud al-Zahhar admitted that labeling the “March of Return” as “peaceful resistance” is a deception. 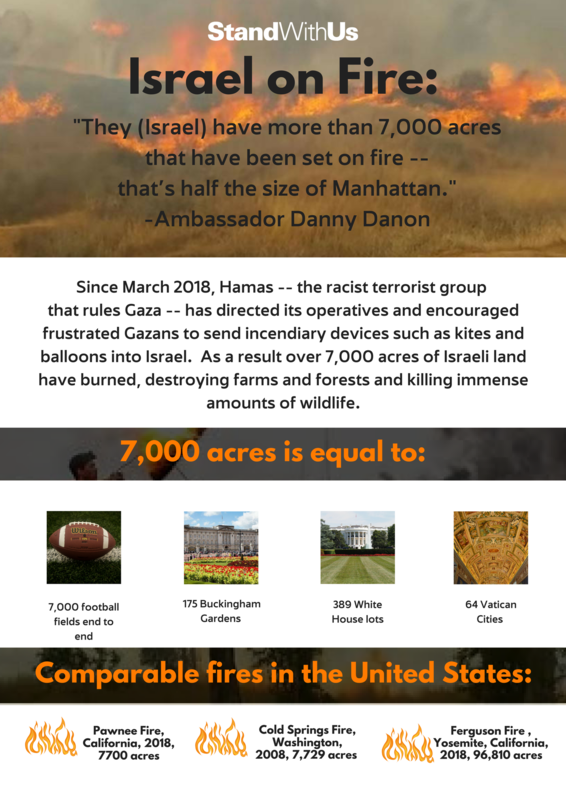 With the encouragement of racist terrorist group Hamas, disaffected Gazans have lit thousands of acres of Israeli land on fire. According to a 2011 UN Report Israel's blockade of Gaza is legal, as it is meant to prevent terrorist groups like Hamas from getting weapons to attack Israeli civilians. Innocent Palestinians in Gaza continue to suffer because their leaders refuse to give up their goal of wiping Israel off the map. Palestinian in Gaza are facing electricity shortages not because of Israel's policies, but because of political infighting between Hamas, the Palestinian Authority, and others. According to the Institute for Palestine Studies, Hamas killed 160 Palestinian children by using them to build tunnels that are used to smuggle weapons and carry out attacks against Israel. Palestinian civilians in Gaza don't want Hamas to use them as human shields by building military tunnels under their homes, but are too afraid to speak about it openly. Hamas is stealing cement that is supposed to be used to rebuild civilian homes in Gaza, and using it to build attack tunnels into Israel instead. Author, journalist, and peace activist Yossi Klein Halevi takes a big picture approach to Gaza and the larger conflict, examining how both communities will have to compromise on their dreams and ambitions to achieve a measure of justice and peace. This piece offers perspective about how Israelis see the international criticism, in context of the 2018 Gaza border violence. This article offers a critical view of both Israel and Hamas in regard to the 2018 violence on the Gaza border. A reporter from the UK based Telegraph confirmed that Hamas paid protesters to attend riots and demonstrations during the 2018 violence on the Gaza border. This article features a Palestinian perspective that is critical of both Israel and the Palestinian leadership in regard to the situation in Gaza. In context of the US moving its embassy to Jerusalem, this article is an important reminder that the Israeli-Palestinian conflict will not end until Palestinian leaders stop denying the Jewish people’s right to self-determination. This report from a group of military experts analyzes the strategy and tactics of Hamas during the 2018 Gaza border violence. This article from a former AP reporter explains how Hamas manipulated the media and international community during the 2018 Gaza border violence. This article suggests that a thriving hi-tech industry could develop in Gaza, if Hamas allows it to happen.